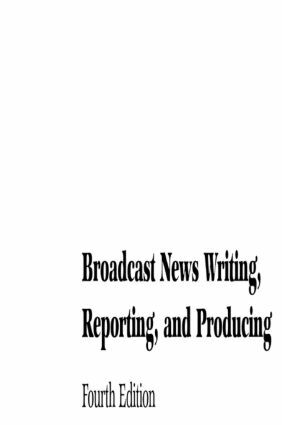 Broadcast News Writing, Reporting, and Producing, Fourth Edition examines the skills, techniques, and challenges of writing and reporting for broadcast journalism. Along with complete coverage of the fundamentals, the text presents up-to-date examples and issues through actual scripts and interviews with the people who bring us the news. The book emphasizes real-life situations, and examines the problems that reporters, writers, assignment editors, and producers face every day. Each chapter contains exercises for writing, review, and discussion so that students can learn and apply what they've read. This new edition contains material on embedded journalists, their preparation (journalist boot camp), including the late CNN reporter David Bloom, and their impact on the news. It includes new examples of tabloid journalism and expanded information on the state of terrorism and crime reporting today. Ted White has been a broadcast journalist since starting his career as a copy boy for The Voice of America while in college as a journalism student. He worked for CBS, ABC, and CNN as well as other major radio and TV stations in NYC where he was a writer, reporter, editor, and producer before becoming a college professor at Southern University in Baton Rouge, Louisiana.